Let me introduce you all to Social Network Analysis. Whether you are a social scientist in academia or industry, clear data visualization has the power to make or break your presentation. SNA is a great way to identify, quantify and visualize information flow and relationships in a variety of environments including the office space, on Twitter and in the neighborhood. I have used SNA in my current work to map the hyperlink network of various departments within a larger school at Georgetown to help answer questions about how departments share information, how they differentiate their individual brands and how they work together to create a unified online voice for the school. In addition to connecting directly to each other, each department links visitors to the same 44 general reference pages. Some departments (#4) offer their visitors more variety in information, while some (#1 and #3) offer their visitors comparably minimal information. 2 pages are linked to directly by only two departments: only #2 and #4 are directly linked to “Faculty and Research,” and more importantly only #4 and #5 are directly linked to the application software used by students to apply to the school’s programs. 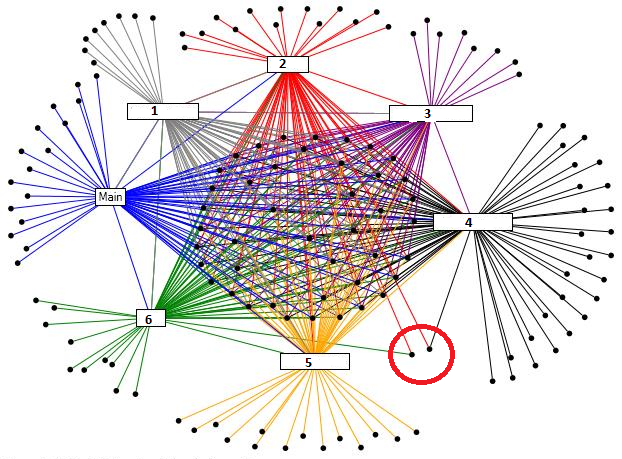 Analyzing Social Media Networks with NodeXL: Insights from a Connected World – Great how-to guide to using NodeXL software with a variety of other platforms including Twitter, Facebook, Youtube, and Email. The Hidden Power of Social Networks: Understanding How Work Really Gets Done in Organizations – Fantastic guide to implementing SNA in organizational management. NodeXL: Network Overview, Discovery and Exploration for Excel – NodeXL software, a free add-on to Excel. In developing communications or marketing strategies, repetition of your consumers own language (collected through interviews, surveys, or even online product reviews) is a simple and effective way of demonstrating solidarity with and an understanding of them. Using language created by the consumers themselves to describe or relate to a product not only provides a springboard from which to write inspiring copy, but an accurate representation of how the average consumer understands your product as well. We’ve all heard from Dating Tips 101 that when your love interest repeats your name in conversation, that’s definitely a good sign. The same effect of demonstrating interest and solidarity operates on a more subtle level in interaction when we repeat forms and structures already used by our conversation partners. As in the example I discussed last month, the repetition of a simple adjective not only demonstrates agreement, but expresses attention and support between parties. Repetition is an endlessly fascinating and useful feature of language in terms of growing relationships. Understanding its effects can transform your interpersonal involvement strategies and help sculpt personalized marketing plans for your target audience – all you have to do is listen like a Linguist! Tags discourse analysis, listen like a linguist, marketing, power and solidarity, repetition, research, so what? Two big thumbs up to Anna Trester for organizing a fantastic event last night! The first of many, this premiere Career Expo focused specifically on bringing together trained linguists currently pursuing careers in a variety of public and private industries. Well attended by students, faculty and friends of the Linguistics department, several of the participants were graduates of Georgetown’s Masters in Linguistics: Language and Communication program and represented institutions including the Center for Applied Linguistics, Ogilvy Commonhealth, Sprung, Reading Partners, the Center for American Progress, the House of Representatives Periodical Press Gallery, Georgetown’s Center for Latin American Studies, the US Department of State, the Census Bureau, Verilogue, and the FBI. It was evident from the lively chatter that the world of linguistics beyond academia is alive and kicking! From the variety of organizations represented, this event also demonstrated the breadth of ways in which linguistics, and interactional sociolinguistics to be more specific, is applicable to business today. This was the perfect environment to cultivate interest and confidence in the power of language among current students, professionals and employers and I’m already looking forward to next year’s event! Tannen (2007) outlines several primary functions which repetition serves in conversation: production, comprehension, connection and interaction. The analysis that follows focuses primarily on the connective function by which evaluative statements can be made, foregrounded or intensified. I will demonstrate that repetition of lexical items in two examples is evaluative of both the topic of discussion and of the participants’ attitudes toward the topic. At the same time, the repetition of a set syntactic formula is a means by which a set of evaluations can be connected and can potentially strengthen one another. In this way repetition of both form and content serve to evaluate and emphasize the opinions of those involved in the discussion, and establish solidarity between them. Previously in the interaction from which these two examples have been taken, my parents, my sister Mary, my friend Ashley and I reminisce about the playground at the elementary school to which Mary, Ashley and I went as children. The conversational frame shifts, however when my mother raises the topic of the removal of apparently unsafe playground equipment from schools. Initially, my mother does not explicitly indicate her opinion regarding the decision to remove this equipment, however it is evident to her listeners that she disagrees with that decision based on pre-established co-occurrence patterns of her use of lowered voice pitch and final falling tone with a sense that the discussion is serious or argumentative. Reproduced below are two separate instances in which both Mary and Ashley offer explicit evaluations consistent with my mother’s indications of disagreement with the decision to remove the equipment for liability reasons while employing the same syntactic form: Object Pronoun + Verb + Adjective (squared below). Their utterances are each responded to by my mother who picks up their adjective choice (bolded below) and repeats it in her own turn thereby ratifying their evaluations while simultaneously intensifying them. Let us go from macro to micro and begin by discussing the repetition of syntactic form. Mary is the first to explicitly evaluate the decision to remove playground equipment in line 68 with “That’s stupid.” In doing so, Mary establishes a syntactic formula (Object Pronoun + Verb + Adjective) by which other explicit and direct evaluations can be made. Additionally, my mother responds in line 69 to Mary’s evaluation with an affirmative “Yeah,” which not only signals agreement with Mary, but also expands the turn-taking pattern to include both participants. Later in the conversation, Ashley and my mother repeat this interactional pattern which Ashley initiates in line 90 with “That’s sad.” My mother follows Ashley’s evaluation immediately with “Yeah” in line 91 and then continues her turn. In employing the same syntactic pattern used previously in the conversation, Ashley connects her explicit evaluation that the decision to remove playground equipment is “sad” to Mary’s previously ratified evaluation that it is “stupid.” Furthermore, repetition of “that’s” ties both utterances to the overarching discussion in addition to each other by maintaining the same reference term (that) indicating the same concept (removal of playground equipment for liability reasons). In this way, the evaluative dialogue is connected across the discourse and work to strengthen each other emphasizing that the removal of this playground equipment is both “stupid” and “sad,” with consequently negative repercussions. It is important to note that Mary’s utterance, “That’s stupid,” was indeed ratified and accepted into the conversation by my mother giving the other listeners an example of a successful means of commenting on a topic that my mother herself raised. My mother’s affirmative response marks “That’s stupid” for other listeners as a ready-made and reusable formula of which Ashley makes use in line 90 with “That’s stupid,” simply replacing “sad” for “stupid.” It is possible that the ratification and acceptance of my sister’s “That’s stupid” is what allows for the continuation of this pattern later in the discourse. In addition to the repetition of syntactic structure in both these examples, we also see the repetition of two lexical items, “stupid” and “sad,” which are initially used by Mary and Ashley respectively to describe the removal of playground equipment. Both terms are picked up by my mother who takes the turn immediately following each of theirs and uses “stupid” again in lines 70-71 after Mary’s turn: “Yeah. I think it’s stupid too,” and “sad” in line 91 after Ashley’s turn: “Yeah it is sad.” The initial use of both adjectives by Mary and Ashley serves an explicitly evaluative function as my mother has not yet described exactly how she feels about the removal of playground equipment for liability reasons. My mother’s repetition of the adjectives in both examples is foregrounded by her altering the prosody of the language surrounding the terms, namely the marked stress on “too” and “is” in “I think it’s stupid too” and “It is sad.” This repetition and emphasis serves to ratify and strengthen Mary’s and Ashley’s evaluations, but her repetition also serves to positively evaluate Mary’s and Ashley’s contributions to her topic and argument, thus demonstrating a level of solidarity with both her participants. Thus, the repetition of both lexical items in combination with the repetition of the syntactic form creates a sense of involvement and solidarity among the participants and serves to tie evaluation of the topic together across the conversation. Power and Solidarity: So What? An important question that I feel is often left unanswered in both academic and journalistic writing is “so what?” – the writer may make interesting and important observations, but unless those findings are connected to the real world by way of actionable solutions or suggestions, they may be forgotten before they have a chance to be useful. I recently wrote a mini analysis of a discourse interaction between my sister and my mother for this blog. I point out that strategies in discourse may be used to achieve power over or solidarity with another person, or they may be used to show power and solidarity simultaneously (as in the example between my sister and mother). The crux of this argument is simply that the strategies an individual uses to communicate an intended relationship message to another, may differ from person to person. Communicative style develops from even the most early interactions we encounter as children and no two styles are the same (though they may be similar). Therefore when we interact with someone who seems to clash with us, or whom we perceive as being passive aggressive or confrontational, it may not be that they are trying to be aggressive, it may just be that our own style does not align with theirs. This does not mean that we should attempt to accommodate the different style to assuage the encounter (although that may be a strategic option), instead it is important to be aware of these stylistic differences and their varying meanings. What I mean may not necessarily be what you hear, and what your listeners hear may not necessarily be what you intended. Take away: In any situation where you aren’t “getting along” with someone, take a step back. Pay attention to how language is being used and think about its various and polysemous meanings. Maybe your meaning is getting lost in translation. Tags conversation, discourse analysis, power and solidarity, so what?